Dear readers – today was a good day I’m pleased to report. I achieved all my goals at the Manchester marathon – that was to go out steady, run a strong negative split and duck under 3 hours. And as a wee Brucie bonus, I even bagged myself a PB into the bargain. I travelled over to Manchester with two teammates from Valley Striders, Andy P and Gwil. It was fun to have a good chat on the drive over and we arrived in plenty of time to park up, queue for the loos and then drop our bags. I was in the front pen and the Valley Striders merged together in a little team near the front, nervously discussing standard runners’ topics – i.e. targets and injuries. I was determined to run easily for the first twenty miles and then reassess. During the first few boring miles up and around the Trafford Park Industrial sprawl, I found myself stuck in the throng behind the 3 hour pacer. Feeling a little claustrophobic, I skirted out to the side of the road and ran a couple of quicker miles in order to get ahead of that group. I settled nicely into a 6:45 – 6:50 rhythm and just started to knock off the miles, feeling like I was really holding back. What an insanely catchy riff! I must learn that on guitar. The rhythm seemed perfect and acted as a metronome as I churned out the miles. I ran quite a few miles with a lad called James from New Marske. He remembered me from the Locke Park 20. It was his first marathon and he was hoping for a sub 3. I tried to pass on my wisdom about conservative pacing and staying very controlled until well past 20 miles. It was nice to pass a few miles chatting. Unfortunately, I had to let him go at 10 miles as I was bursting for a pee, so I dived off behind a hedge. In Altrincham, approaching halfway, I started to see the speedier Valley Striders coming past me in the opposite direction – Andy M, Gwil then Jon P. I did my best to shout encouragement across to them. The halfway loop around Altrincham centre was brilliant – massive crowds, several bands and a children’s choir. A great boost. I went through the halfway point in 1:28.45 – around 45 seconds quicker than I had planned, but I felt great, I knew I still had lots in the tank. 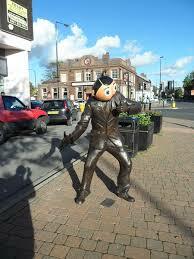 I kept the pace consistent back through Timperley, tipping a nod to the statue of Frank Sidebottom as I passed, and then back into Sale. Gradually the field was thinning out, I was steadily passing lots of runners. I caught up James from New Marske again – he was starting to feel it, he said his ankle was troublesome, but he was digging in. I pressed on and I went through 20 miles in 2:14.26, still feeling good. I decided to squeeze the accelerator a little – I was quite enjoying passing people to be honest. My fastest mile of the whole race was mile 21 – a 6:33 and I tried to keep on running positively, without tipping myself into the red. Through Urmston and with only a parkrun to go, we hit quite a strong breeze into our faces, this checked my pace back to 6:45 – 6:55 for the final few miles, but I was happy to cross the line in a chip time of 2:56:02 for a 30 second PB. After a couple of slightly shaky steps in the finish area, I was relieved to know that I was still walking fine and had no problem in picking up all the finishing gubbins and retrieved my bag from the bag drop. 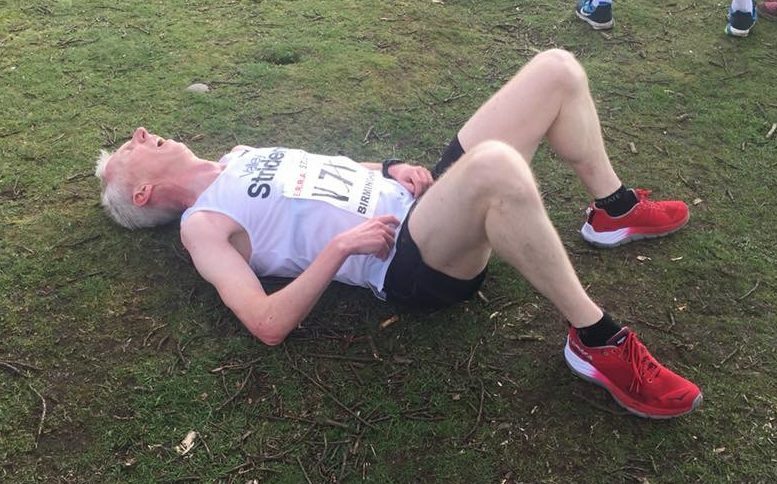 My teammates had had a mixed day – one had to DNF through injury, but many had run really strongly and I was delighted to learn that Andy P had smashed his PB and earned a GFA place for London with a 3:16 – a brilliant run. Training partner Nobby also had a brilliant run and joined the sub 3 club with a 2:58, a fantastic effort. His perfect day was capped off with Villa winning the FA cup semi-final. I checked the results tonight and saw that James from New Marske finished in 2:59:58 – wow! Not bad for a first marathon. So, all in all, a great day. I maybe ran a tad faster than I intended, but what the heck, I was enjoying a great day out and I’m pretty sure I will be able to get back into something like normal training after a couple of recovery days. The countdown to Comrades has started!